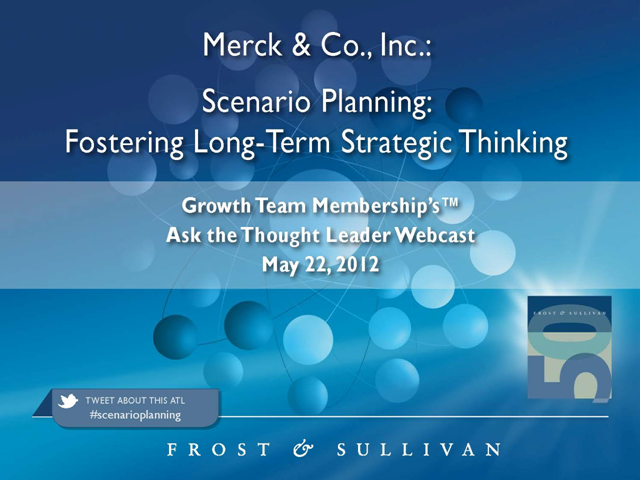 On Tuesday, May 22, 2012, the Growth Team MembershipTM will present a case-based best practice on how the corporate strategy function at Merck & Co., Inc. used scenario planning to explore long-term risks and opportunities. Featured Thought Leader Douglas Black, General Manager for the Innovative Ventures Unit at Merck, will share key lessons learned and participate in a Q&A session. Keith O'Brien from the Growth Team Membership and Douglas Black from Merck & Co. Presented by: Keith O'Brien from the Growth Team Membership and Douglas Black from Merck & Co.